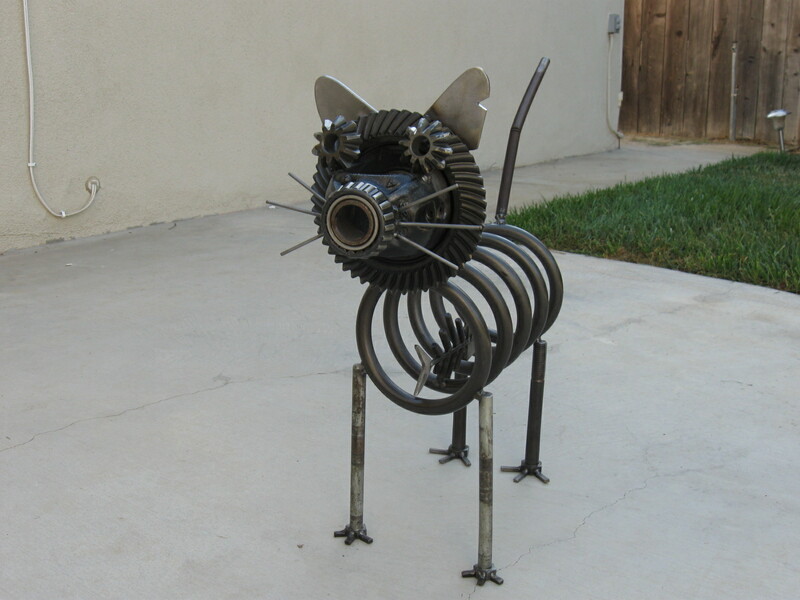 Scott Evans from Bucket of Bolts creates charming sculptures from repurposed hardware. 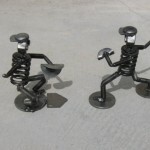 He has been crafting for several years and has honed his style and technique to produce unique artwork fit for indoor or outdoor decoration. 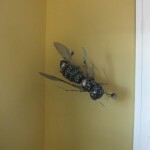 Scott was kind enough to take some time and answer questions about his sculptures and crafting process. 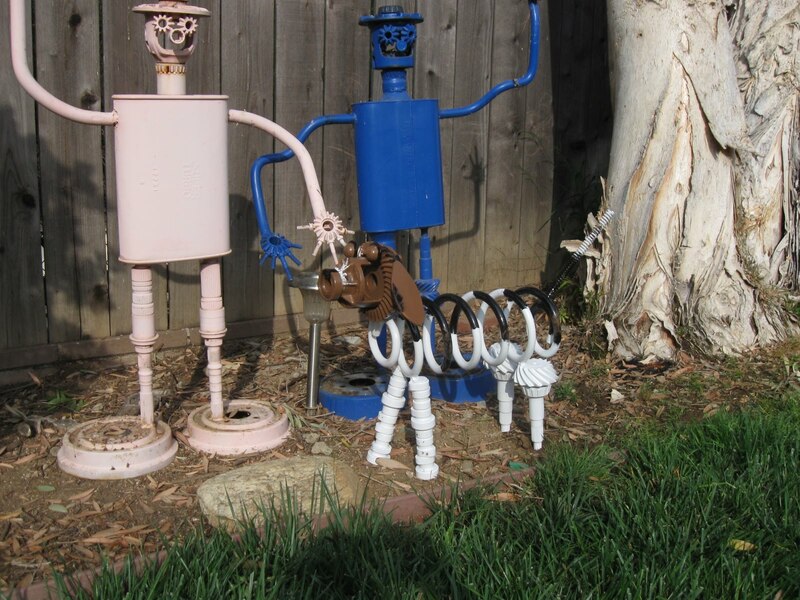 How did you get started creating sculptures out of recycled materials? I belong to a local Jeep club. I noticed some Jeep parts were being either being broken or upgraded and no longer needed laying around. Some of the shapes reminded me of other things. So I asked my Jeep friends if they had stuff laying around they no longer needed. 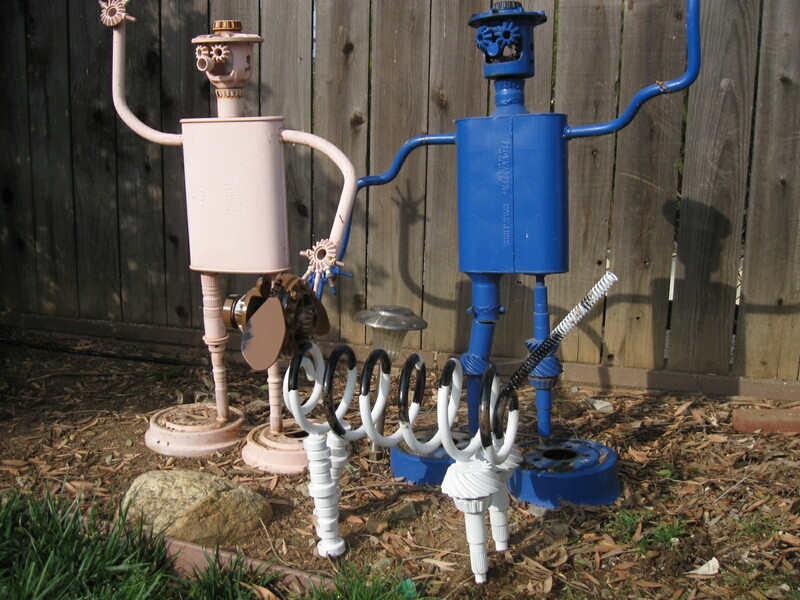 My first sculpture was the blue robot. It took me 2 years to gather the parts needed for just the blue one. So I kept asking around and found things to make the pink robot. I made them for my kids. Where do you find materials for the sculptures? At first I looked around my garage to see what I had on hand. Then I started to ask my friends if they had anything laying around they no longer needed. When I started to bring some finished pieces to work to show my co-workers, they would offer stuff from around their house. Then word of mouth spread the word and from time to time people stop by with stuff after cleaning out their garage. There is a engine shop I stop by every few weeks to see if they have anything I can use from their recycle bin. There is a 4×4 shop that calls me when his recycle bin is getting full. Sometimes I can’t find a part or piece that is needed so I wander around the hardware store. My eyes glaze over in those places! Inspiration can be tough for crafters, yet you make very inspired pieces with the additional constraint of having to work with the items you have on hand. Tell us about how you come up with a final piece. For me it starts with one item. I look for a basic shape I need for whatever I am building. Then I see what else I have and move on to the next part of the build. Sometimes I have all the parts spread out in advance, sometimes it’s a whim and things get added as I get to the next stage of the build. 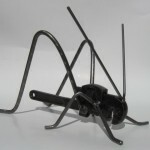 What tools do you use to create the sculptures? 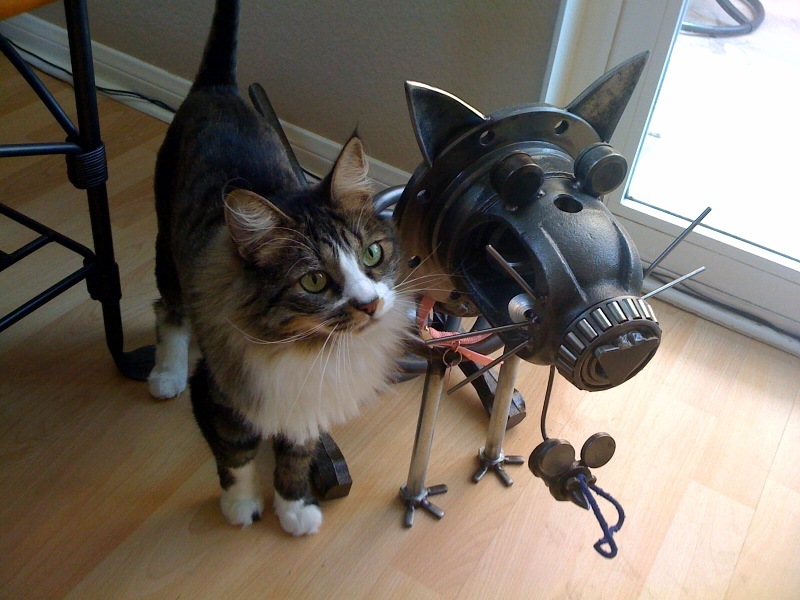 I have a welder, two 4.5 inch grinders, a hand drill, drill press and a bench-mounted vice. For the most part that is it. I have no torch or plasma cutter for cutting my material. Everything is cut using a grinder with a cutoff wheel. I made my own jig for bending some of the small items such as nails of various sizes or round bar steel. That way I can get curves and bends in the shape I need. No heat is applied, it’s done with leverage. 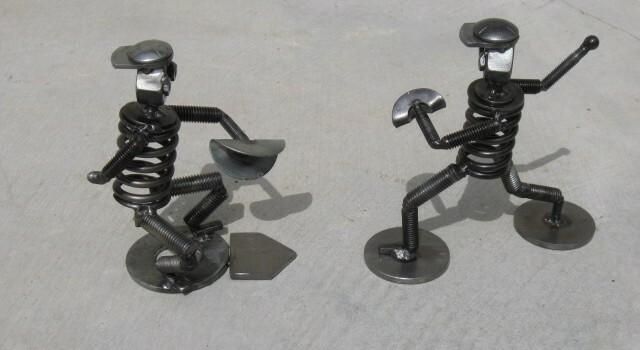 The sculptures have a recognizable style – what is your finishing process? It takes forever to clean the metal of grease, oils, welding spatter etc. I use a wire wheel on my hand drill, small steel brushes, a chisel and flat blade screwdriver to get off the welding flux. After all the piece is finished and cleaned off I use a clear spray to help prevent rust or dirty hands if touched. Sometimes I add color to the piece. I use either spray paints or brush on the paint depending on the piece. 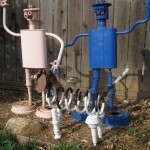 Personally I prefer the natural metal colors with a touch of color depending on the piece. I noticed on your blog that you’ve sold pieces locally for a number of years; what prompted you to list on Etsy and sell online? I was showing things to a co-worker who sells on Etsy. She has been on Etsy for years. I had never heard of it before. She was saying great things about the site and was always trying to get me to sell on there. So I told her when I get some pieces finished that didn’t have a home I would list them. 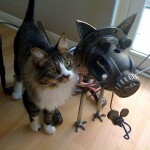 I especially liked the cat sculpture with the fish in the ribs – do you have a favorite item or theme? 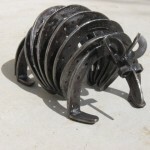 I noticed you have a few sports-inspired creations, do you prefer to make those or the animal sculptures? Scrappy the Cat was my first attempt at a cat. He really has a special place in my heart! But I do like Hidey Boo a bit better. The mouse in his mouth and fish in his belly make me laugh! I like the animals the best. My favorite things are the Roosters. Reggie in particular is my favorite. The sports figures started as a gift for my Father-in-law for Christmas a few years ago. He is a huge baseball fan. Some of the other sports figures where commissioned so that is what I came up with. 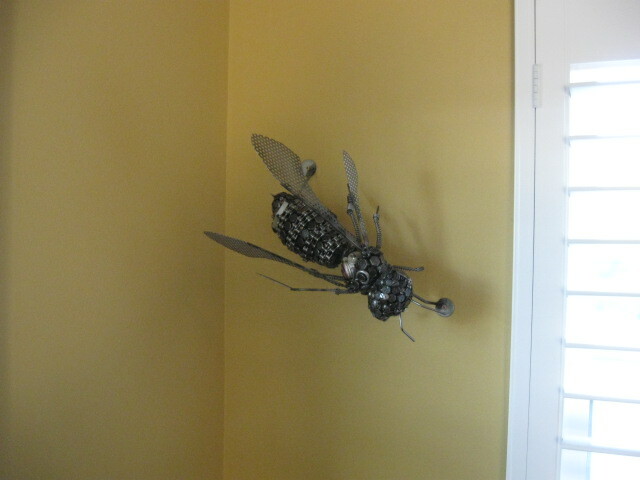 I have to admit I’m creeped out by the insect sculptures. My wife hates when I do the insect/ spiders. 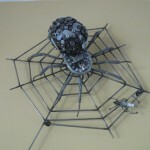 When I made the Orb spider she wouldn’t let me keep it in the house. Same goes for the Bee. They stayed in the garage until I could deliver them. Do you design for indoors or outdoors? 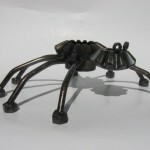 I noticed larger pieces on your blog and smaller pieces on Etsy. Have you found a target market, or that certain sizes have greater appeal? Indoors or outdoors depends on the piece. The larger ones I imagine outdoors but to my surprise people that I have sold them to keep most of them indoors. 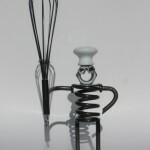 I thought I would start selling the smaller items on Etsy to start. These things can get heavy and hard to package properly. The large dogs can weigh close to 50 pounds. You can’t put one of those in a cardboard box and drop it off at the post office. Shipping costs is a big concern, plus adding in costs to build a container makes the cost of goods go up. With the economy the way it is I try and keep my prices low – shipping big items makes them less likely to sell. Smaller items are easier to find a spot around the house for too. The selling online thing is very new to me. 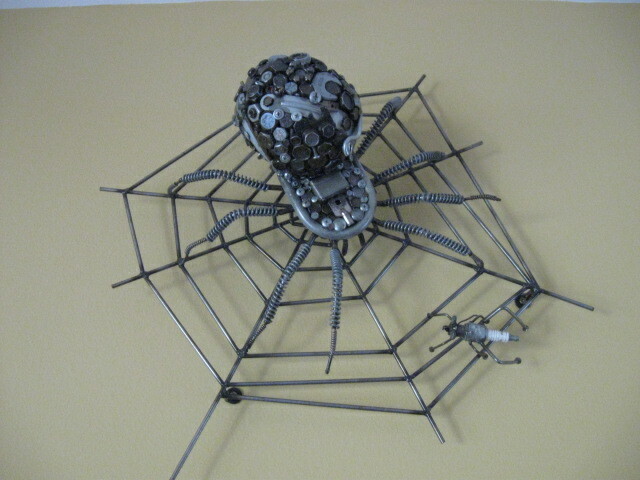 All of my work has been sold locally or is small enough to put in a flat rate box from the post office. Awesome and unique artwork. 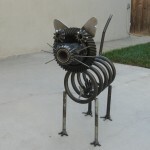 I was definitely reminded of a fun local attraction in Colorado, the Swetsville Zoo. 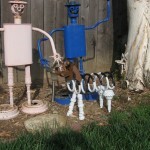 Visit Scott’s blog to see his latest and past creations or get down to business in his Etsy shop. Thank you so much for taking the time to put this together! You guys are awesome!